We went on a pleasant drive to Atotonilco, a very old Mexican town we have visited before. It’s a drive of about an hour an a half, across the treacherous strip of road where we got our flat tire a couple of weeks ago. Nearby Jalpa’s patronal fiesta was held over the last weekend. Before we left, we drove to there to buy some bread from one of the vendors before they pulled up stakes and left for another fiesta. There were lots of candy vendors, with marzipan and a variety of candies made from squashes and yams. There were several vendors of kitchen items, and plastic buckets and pans of all sizes.The children’s games were still there, too. The bread vendors carry their ovens around with them, and one had large beautiful bread coming right out of the oven. Chon bought one to take with us to Juana, his sister. Atotonilco is a commercial center located in the “heights” of Jalisco, and was built in a bowl: to enter the town the drive circles down from the flatter lands of agave and orchards. Its known history began in 1528 (yes, 1528), and the conquistadors arrived in 1530. Known for oranges and lemons, it is also a center for tequila distilleries. AND, there are hot springs there! The drive to Atotonilco was uneventful, and we saw some workers filling the enormous potholes that had tormented us on an earlier drive, and we arrived after noon. We parked a couple of blocks from the very large templo, and walked to the town square. The temple of San Miguel Arcangel was built in the mid-1700’s, and appears to occupy most of a city block. The style is very similar to the famous temple in our neighboring town Jalpa De Canovas, described as renaissance and plateresco (florid), with a bell-shaped top. It towers above the city, and is easily seen from the mountains above. It is built of quarried stone. Corinthian columns inside draw the eye up to the light-filled dome. When we entered, a woman was mopping the large area surrounding the altar, and singing. The sound of her voice hung in the air, with a long decay time. We walked around, found ourselves by the old mercado, and remembered the hotel across the street. We went in and the woman at the front desk answered many questions about the area. Rooms are 300 pesos per night. That’s less than $30. Right outside the hotel was a place advertising lunch of chilaquiles and beans for 13 pesos. We bit. It was very good, and we felt fortified for more walking. In the mercado Chon made a deal for a pair of huaraches for 90 pesos, and we stopped in at a couple of “cibers” to try to purchase a USB extension cord. It began to rain, harder and harder. We wanted to get to Juana’s house before it got late, so we headed back to the car, and back towards Arandas, the famous tequila town. We stopped at our favorite “private label” merchant (in this case, private label means no label at all), and bought a garrafon to take home. We headed past the very old church with its very old, very heavy bell still hanging in its temporary spot, and drove toward Juana’s house. Out in the open spaces, dotted with agave fields and cattle pasture, we headed down a hill only to see a line of many stopped cars, and a barricade made of a truck that had slipped off the road, and was completely blocking passage. We waited with the other travelers until two large tow trucks manages to pull the truck backwards and onto the roadway again. When we passed the truck, we saw the shaken driver, several transit police cars, and the two tow trucks. Traveling on, we arrived at Juana’s house in cold Josefino. She efficiently prepared us tacos of tasty chicken breasts, with beans and some spaghetti with a terrific cream sauce with rajas. We contributed our beautiful fiesta bread, and left after a short visit. We wound down the mountain road, passed through Doblado, and arrived home after 8 p.m. This entry was posted in Uncategorized on October 30, 2012 by gubabbaboy. We were recently invited to Puerto Vallarta for a brief visit, and it was action-packed. 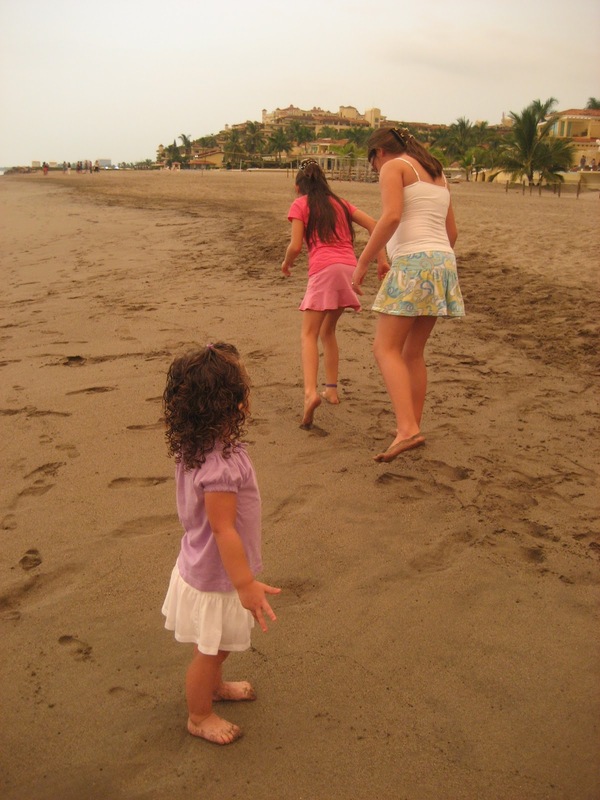 Daughter Laurel and her family went to Vallarta for two weeks, and ended up cutting the stay short because baby Keely had a bad cold with respiratory problems. We left on a Thursday morning and headed for Vallarta, having just repaired a little bulge on a rear tire. We followed Mapquest directions, which proved just fine, and the route we had guessed. We went north, through Guadalajara, and headed toward Tepic on a familiar toll road. As you exit the toll road the road falls steeply down and down. We had a lunch and continued through Chapalilla and some other small towns, at times stuck behind slow traffic. The hilly area is at times open, with pasture or crops, and other times is heavily wooded and shady. That portion of the trip is lengthy. When at last we reached the ocean it was almost a suprise, because we had been waiting so long to see it. We followed the coastline south to Puerto Vallarta and searched for the Marriott, and overshot it by quite a ways, so we got an idea of the town. Although there are luxurious hotels and many tourist attrations, the town is old and rather charming. Drivers: Vallarta is one of those places where to turn left, you must get onto the right parallel road, called a lateral. Then you may turn left, across the traffic on the main part of the road, on a light. After locating the motel and finding our way to the check-in desk through a light drizzle, we arrived at our room, adjoining our hosts who were in a large suite. They needed the space because of all the things they had brought – crib, stroller, sports equipment. There was a refrigerator and a balcony overlooking the beach, and sea turtle release program. In the afternoons you can attend a release of baby sea turtles on the beach. Breilyn and I went for a stroll on the beach, hoping to see that. The Marriott is sumptuous, especially for folks accustomed to life in a tiny town. There are many shops and many eating choices, and of course, a pool. Dion and Laurel took us out to a wonderful Japanese dinner, with fancy spatula tossing, and a meal prepared in front of us on a large grill. The fried rice prepared by our chef was very good. Normally fried rice is probably not something one would mention, but really, it was wonderful. We had Mahi Mahi, the “catch of the day”. The only negative thing about our overnight stay I could mention is the lack of a good internet connection. I was hoping to update some things on my computer that I usually can’t do at home (I have broad band which is limited in megabytes as well as service). The signal there was not good, so that task was frustrating.I couldn’t add anything to my Facebook page either. But hey, it was a vacation and that was a miniscule disappointment. We slept well, and breakfast the next morning was impressive. It was buffet style, with just about anything a person could desire. There was a large variety of fresh juices and aguas, coffee and tea. There was sushi. There were fried potatoes cooked with a dark chile. There were fresh breads, bacon and ham. There were little empandas. There was a woman chef preparing eggs to order in front of your eyes.There were fresh tortillas and cooked meats and guisados. I would have sampled everything if I could have! Much too soon it was time to get ready to leave – Laurel’s family had afternoon flight reservations. We all said goodbye as they were whisked off to the airport in a large hotel Suburban. We had decided to try a different route to Guadalajara, and we headed north a ways on the coast. After stopping at a music store and a couple of places that made rustic furniture we found the road we wanted, to Guadalajara by way of a town called Mascota. This road went UP. The summit was over 6,500 feet elevation. There were many topes to slow the traffic, and several small towns. The road was not good, and there were plenty of large and deep potholes. But is was a gorgeous drive, and I believe it might have been a shorter, more direct drive. At the highest elevations we began to see signs advertising products of the region: honey, pottery, and something called “raizilla”, which turned out to be a distilled tequila-like drink; very potent, at 40% alcohol. Like tequila, it is made from agave, but the agave plants are called “lechuguilla” as they have lettuce-like, wider, curvier leavves. It was made illgally for many, many years, but now is being marketed. The bottle we purchased was labelled “Raizilla Ilegal”. The area reminded me of the Sonora/Tuolumne area in northen California, that I have always liked. We felt right at home there, but we had to move on. As we went down after the summit I was curious about the town of Mascota. I mean, who wouldn’t be? A “mascota” is a pet! But no, the place wasn’t all about pets – the name comes from the tongue-twisting “Teco Amaxacotlan Mazacotla (not Spanish!!) which translated to Spanish means a place where there are deer and snakes. The conquistadores named it Valley of Deer. Another name was Emerald of the Sierras, and it really looks like a jewel when you see it from the twisting road above the valley. Once in town, you notice very clean, rock roads, and closed-off houses. The people were friendly, some girls telling us that the daily wage there is 100 pesos (less than ten dollars). That, combined with the high prices for necessities, makes for a difficult life. (Men are sometimes paid 150 pesos/day for labor, according to the same source.) This is another thing, I might venture, that the area has in common with the Sonora area of California. As we continued toward Guadalajara and home we stopped at a view point high above Mascota for a couple of photos. At the same spot was a pickup with the hood up, and a family watching the daddy peering into the engine cavity. Chon asked what the problem was, and the man told him that suddenly there had been “oil” spraying all over, and it had soaked the right front tire. After some conversation and thoughtful analysis of our own past experience, Chon decided that it likely was the transmission fluid. And it was. The guy handed us 500 pesos (displaying an unusual amount of trust) and we went back down to the nearest gas station and purchased two bottles of transmission fluid, returned, and added it to the car. When he switched it on again, the fluid again began to spew. Closer examination revealed a hose with a big cracked place, luckily near the place it was fastened. The man handily cut of the damaged part and replaced the clamp. During the time we were there, we all made friends. There were two little boys with their mom, and we all shared pretzel chips (thank you, Laurel) and chatted. When we took off again, it was with the phone number of the man, who lives in Las Vegas, Nevada, and a standing invitation to a big steak dinner whenever we might be passing through. We follwed a pickup full of happy (obviously drunk) workers down the mountain until they stopped at a bar, then continued along a wider portion of highway, dotted with topes and other traffic-slowing devices until we reached Guadalajara. Now – we have a history of making wrong turns while returning south through Guadalajara, but the last couple of times we had gone directly through with no unfortunate deviations. This time we missed a “slight right”, took an off-ramp and got turned around, but it took only about a half hour. Relieved, we continued to the famous toll booth and toward home. You might think that because of our Good Samaritan points we we had earned earlier in the day, we would have a smooth trip home from there, safe, with no problems, but that was not to be. A road between Arandas, the famous tequila town and the gas station about 1/2 mile from our rancho, is famous for its potholes. They can be so large that can they stretch like emormous yawning cauldrons all the way across the road. We safely navegated around and across several nasty holes, and then an approaching driver blinded us with brights (smarter than this driver, I guess). I should have just stopped right there in the road, but instead, continued to progress. Bam!! We hit a pothole with both right tires, and a few seconds later we had a flat. At about 1:00 a.m. Luckily, we were only about 100 yards past a gasoline station, unluckily closed for the night, but luckily there were living quarters above, with lights on. Unluckily, the man who answered our calls for help refused to help – said he didn’t have a jack, and wouldn’t come down. We thought of calling for help. Luckily, we had both of our phones along. Unluckily, neither phone was receiving a signal. Luckily, I had my laptop. Unluckily, its broadband couldn’t find the signal either. We had a small, toylike jack in the car. We located it and squeezed it underneath the tire after loosening the nuts. With plenty of cursing, Chon managed to raise the tiny jack with its miniature handle Once up, tire removed, we heard a quiet creaking sound, and the jack just – well, bent, and twisted under the car, leaving the brake right on the pavement. We were far from any town. We could see house lights in the distance, and occasionally we could hear the far-off barking of a dog when we walked around the car with the light of our cell phone. No cars passed. Earlier, right after we had stopped and were still full of plans and hope, three or four cars passed us, headed toward town, probably leaving Friday night parties. But now, no cars passed. I got in the car, as it was getting quite chilly, and rested. Chon was outside, and I thought he was probably resting, too. But after about fifteen minutes he called me out of the car to try a new idea. (That’s just the kind of guy he is.) I staggered out of the car, and searched for the large, flat rocks his idea required. But first, we had to remove the twisted jack from under the car. He had found a thick pipe, and he levered the car up with that while I jerked the jack out with a small piece of rope we had in the car. Then he tried to straighten the twisted jack, and we (he) began to raise the car again, in tiny increments. We then placed one of the rocks under the frame, and moved the jack closer to where it needed to be, and he raised it some more. A car passed, the driver ignoring my frantic cell phone light signal. We placed another rock on top of the first, and began to raise the car again. A car appeared in the distance, and I raced to the edge of the road to signal it, hoping to cash in on our Good Samaritan points. This car stopped. The driver was not drunk, or an axe murderer. His had been one of the cars we had seen heading to town earlier. He had taken his wife to the hospital, he said, to get some stitches removed. In the middle of the night. We didn’t ask. He told us that higher up into the hills, and lower down into the valley, there was phone signal, but we were in a dead spot. Luckily, the driver had a jack – and it wasn’t a toy jack! We raised the car, placed the spare tire on, thanked the man profusely, and got in the car to leave. Unluckily, the battery was dead. We had used the lights for a couple of hours, for safety, and to see what we were doing. Luckily, we waved the driver back just in time. We had cables, and the car started up right away. We were about twenty miles from home. I drove even more slowly and carefully, and we sucessfully avoided any other mishaps. We arrived home around 4 a.m., unloaded our bags, and fell asleep. This entry was posted in Uncategorized on October 28, 2012 by gubabbaboy.